Born in Kansas City, Melba moved to Los Angeles as a child, and became a working musician at age sixteen. She learned to arrange and write, as well as play, and quickly found herself snapped up by Gerald Wilson, who hired her as a copyist, arranger, and trombonist during the War. When Wilson's band broke up in 1948, she joined Count Basie, and in 1949, Dizzy Gillespie. Her writing and arranging were formidable, and after Dizzy's big band folded in 1957, she stayed busy in New York with writing and playing. She returned to Los Angeles in the late 1960s, and moved to Jamaica in 1974, to teach at the Institute of Music there. She returned in 1979, settling in New York to lead her own group. She suffered a stroke in 1986 that ended her playing career, but continued to compose and arrange until her death in 1999. 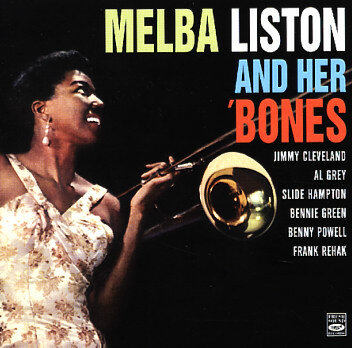 Melba appears on numerous big band sessions from 1945-57, and recorded one album as a leader. She occasionally returned to playing in her later years, and can be found on a handful of records, with luminaries like Quincy Jones, Randy Weston, Clark Terry, and Oliver Nelson, from the 1960s. All About Jazz musician pages are maintained by musicians, publicists and trusted members like you. Interested? Tell us why you would like to improve the Melba Liston musician page.